Chef Tom Colicchio brings his 'wichcraft cookbook to Bryant Park for a lunchtime pow-wow. 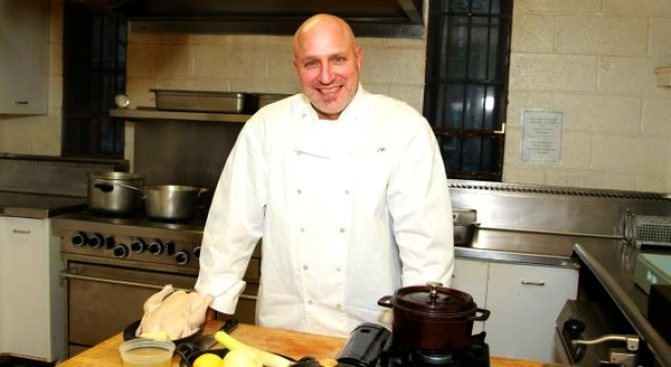 Before he was a Top Chef badass judge and a puzzling shill for Diet Coke, Tom Colicchio was a guy who made really, really good sandwiches at ’wichcraft. (We’ve also spent many a dollar at his craft restaurant, and ordered more than a few plates of figs wrapped in prosciutto at his craftbar). Colicchio’s stuffed his new cookbook “'wichcraft: Craft a Sandwich into a Meal – and a Meal into a Sandwich” with sammie recipes perfected in the ‘wich kitchen, such as the roasted turkey with avocado, bacon, balsamic onion marmalade, and mayonnaise. He’ll discuss the book – and the fine art of the gourmet sandwich at the Bryant Park Reading Room with co-author Sisha Ortuzar. The event takes place at 12:30 – c’mon by on your lunch hour and, uh, bring a sandwich.